Finding activities for creative and stimulating activities toddlers can be quite a difficult task considering pretty much anything shiny or loud will draw their attention. Managing play dates with multiple toddlers gets even trickier, making things exponentially more difficult to hold their attention. The best way to have a fun and productive play date is to organize a fun crafts activity, but what to do? Here are two great crafty activities that will be sure to entertain your little group of toddlers. 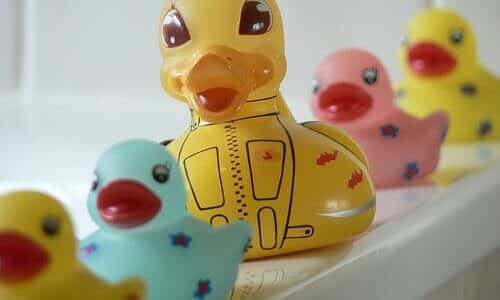 Rubber ducks have been a childhood favorite for generations and it is easy to see why. They provide youth children with a fun, interesting, and most importantly, safe toy to play with. So pick up some decorating supplies like markers, stickers, and paint, and encourage your little ones to give their rubber ducks a name and back-story to really get the project going. In terms of paint, waterproof acrylic paint works best as it is easy to use and will not come off when your youth one decides to bring their rubber duck into the tub!
. Start off by writing the name of each kid on the bracelet and just let them customize them from there. Toddlers love having fun items with their names on them and they are sure to be proud of their creations. Both of these projects are a fun and safe was for toddlers to get creative and will be sure to hold their attention for a couple hours.